A further phase in the regeneration of Old Hatfield commenced last month as work began on York House to the eastern end of Salisbury Square. The project aims to deliver a refurbished landmark building in the Square, a key component of the plans forged with the assistance of residents and businesses at the 2008 Charrette. 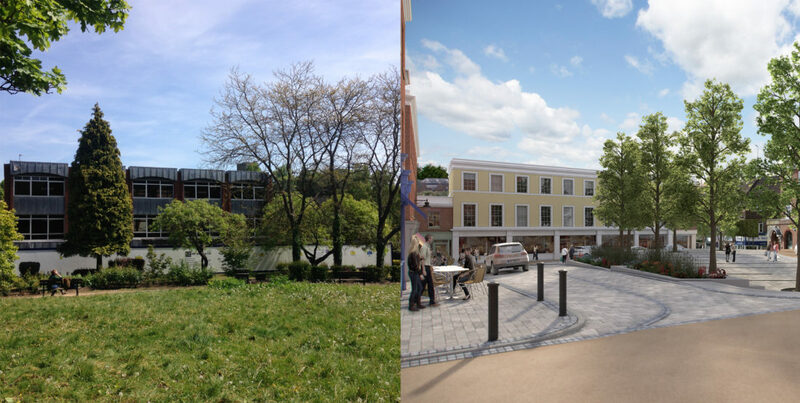 (pictured in the CGI rendering above) This work will see the existing building stripped down to its structural frame and remodeled with a new aesthetic befitting the Square. The project is being undertaken by MP Building Ltd, who have previously delivered the high quality regeneration of The Old Bank House in Salisbury Square. The building will benefit from high levels of insulation and services ensuring that it is efficient and fit for purpose well into the twenty-first century. The building will retain car parking to the rear, accessible from Park Street. The building’s use will comprise retail on the ground floor alongside office space on the second and third. In the absence of any substantial and unforeseen challenges, works are due to complete in November. Gascoyne Cecil Estates are grateful for cooperation of its neighbours for the duration. This marks an exciting further step forward in the long term regeneration of Old Hatfield, with the aim of bringing renewed vibrancy back to the neighbourhood centre.